It was already 8pm and we were still trying to find our way to the wharf. Jam, my blogger friend asked the locals for direction but we were still lost! Earlier in the afternoon, we had bought the tickets to the night cruise from a local agency. The tickets cost 120 yuan (RM57) each. The lady at the agency had reminded us to be at the wharf by 8pm. After our dinner at Hao Da Ma Restaurant, we had walked back to Central Square and not once did we think we would not be able to reach the wharf in time for the night cruise. But as luck would have it, we somehow got lost and could not find our way! However, luck must still be on our side when halfway, we bumped into the lady from the agency! She was actually riding on her motorbike and when she saw us, she was surprised why we were not on the cruise. After explaining to her we lost our way, she quickly pointed the direction to us and rode off to delay the cruise for us! What happened next must be the most unexpected thing I ever did on a holiday. We ran as fast as we could, hardly stopping to catch our breaths, as if we were criminals on the run in a foreign country! Gosh! This must be my first time running like that during my travels! Thank God for the horse meat I ate earlier - perhaps that gave me the strength and speed, haha!! By the time we reached the wharf, it was already 8.30pm! Needless to say, I was breathless and completely drenched in sweat! But thank God and thank that lady from the agency, we managed to get onto the cruise! Phew!! 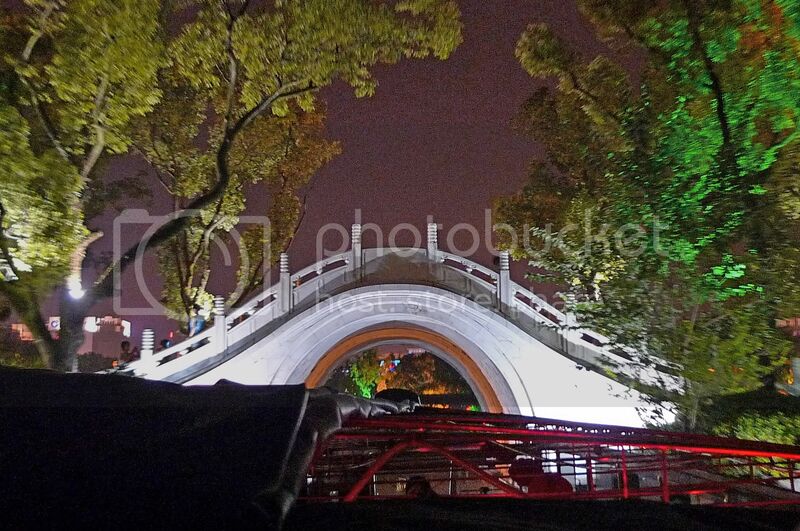 What an experience on our very first night in Guilin! The above is the route of the Two Rivers Four Lakes cruise. Sorry it is all written in Mandarin. I could not find one with English translation. 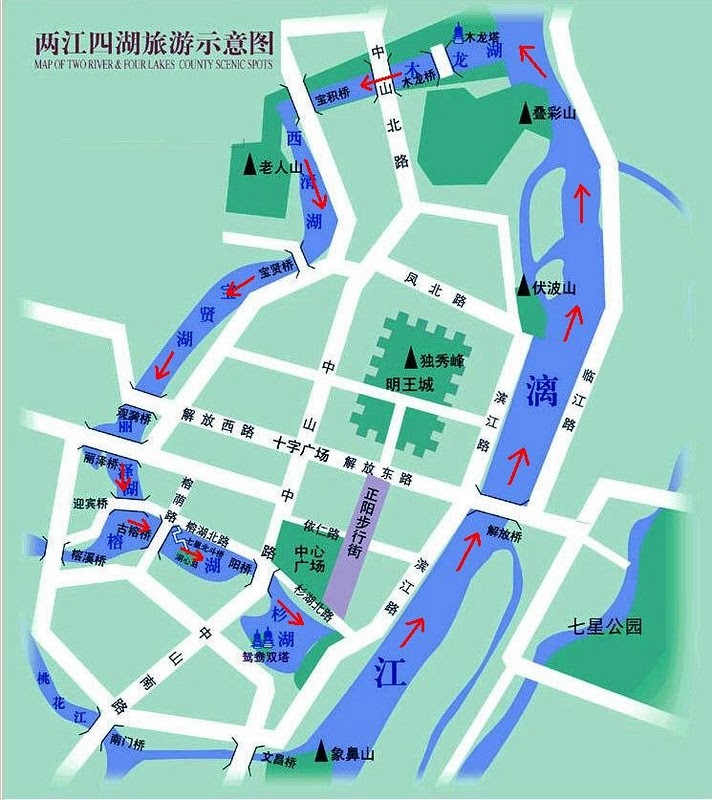 Like its name sake, the Two Rivers Four Lakes scenic area consists of a water loop of two rivers and four lakes that enclose downtown Guilin. The two rivers are the Li River (漓江) and its tributary, Taohua (Peach Blossom) River (桃花江) and the four lakes are Rong (banyan tree) Lake (榕湖), Shan (Chinese fir) Lake (杉湖), Gui (Osmanthus) Lake (桂湖) and the Mulong (wooden dragon) Lake (木龙湖). 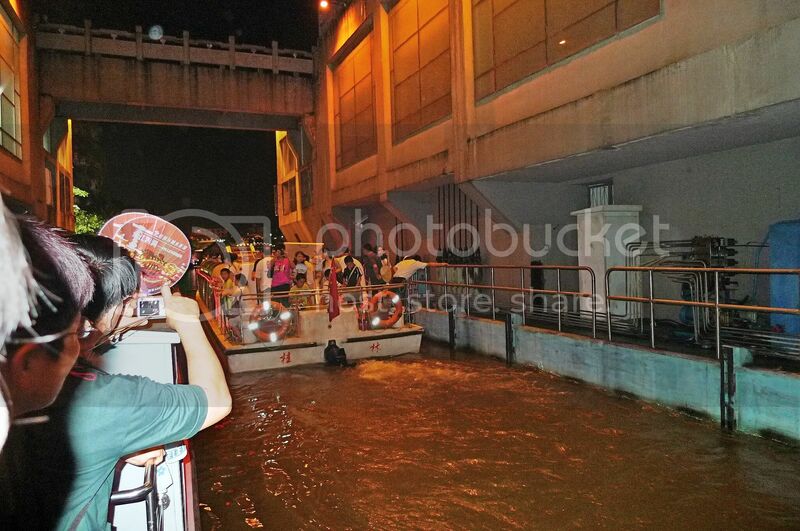 From the Li River, our boat entered a lock area, where water was admitted to raise the boat up several metres. 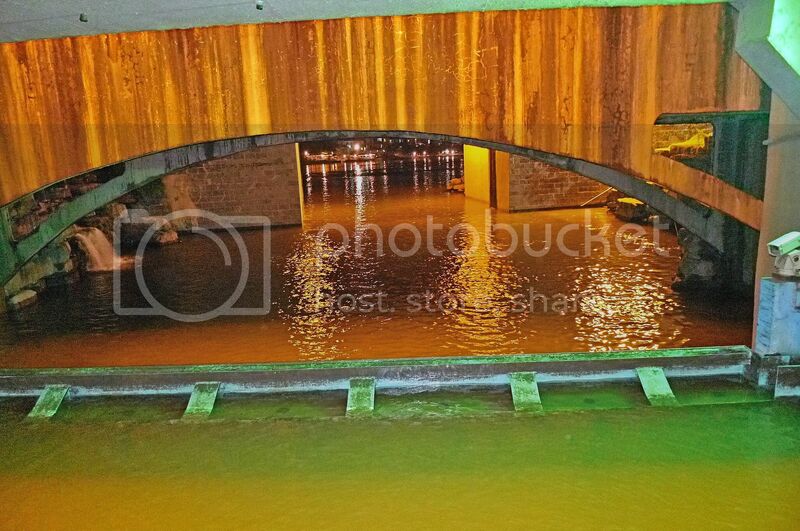 Once the water level in the lock area reached the same level as the lake, our boat continued with the journey. If you have been to Mines Wonderland and took the lake cruise, you would know the same concept being employed there. The first lake we entered into was Mulong Lake. This is the view of the lock area as our boat was leaving it to enter Mulong Lake. 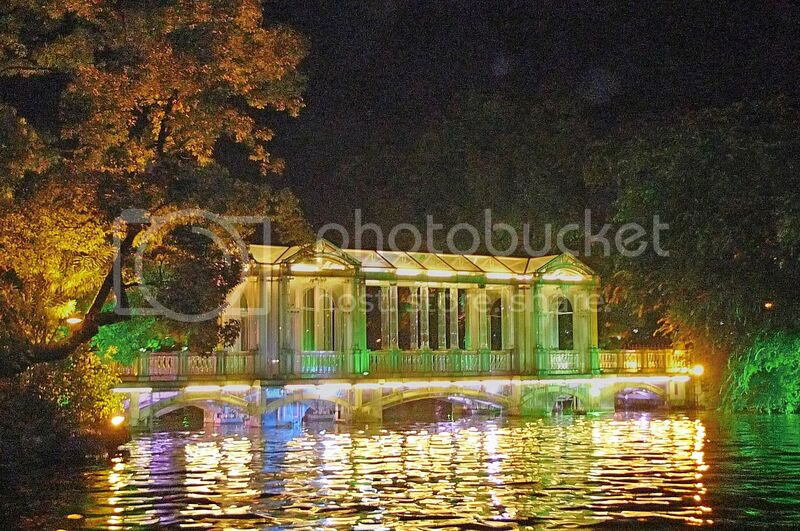 The waterway system was beautiful with buildings, trees and plants decorated with coloured lights. 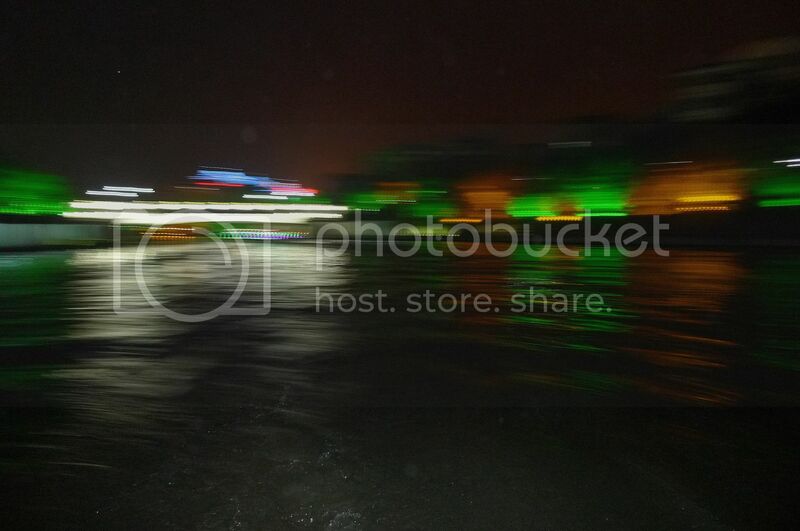 But since it was night time and the boat was moving, my photos did not turn out well. I guess this was the best I could do. I managed to capture this nice looking Mulong Pagoda (木龙塔). After Mulong Lake, we entered Gui Lake, followed by Rong Lake and Shan Lake respectively. I learnt that there were altogether 19 bridges connecting the two rivers and four lakes! Wow! Sure beats Putrajaya which has only 9 bridges! Haha. Now if you will excuse my poor photos, here are some of the bridges. I only managed to capture a few. 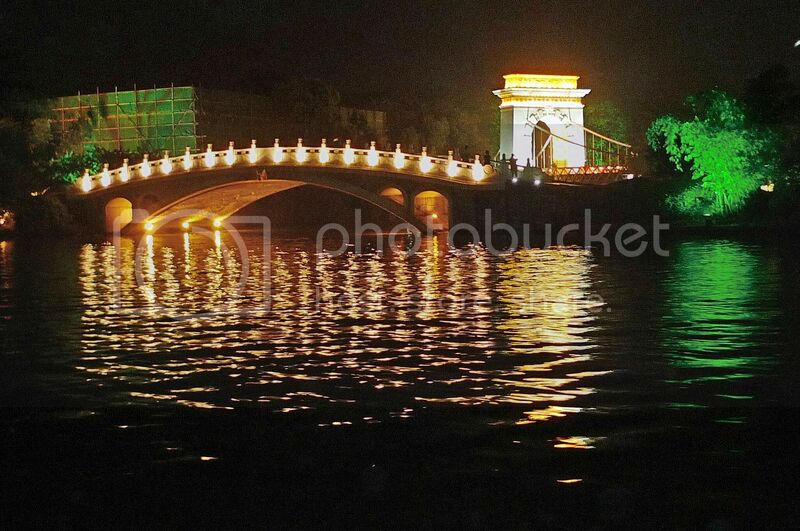 The above is the ancient twin marble bridge which separates Gui Lake and Rong Lake. Some of the bridges were styled after some of the world's famous bridges. Do they remind you of bridges you have seen somewhere? And then I saw the most awesome looking bridge - the Crystal Bridge at Rong Lake! It sure looked as if it's made from crystals! Now if you think those bridges are interesting, wait till you see what is underneath them! 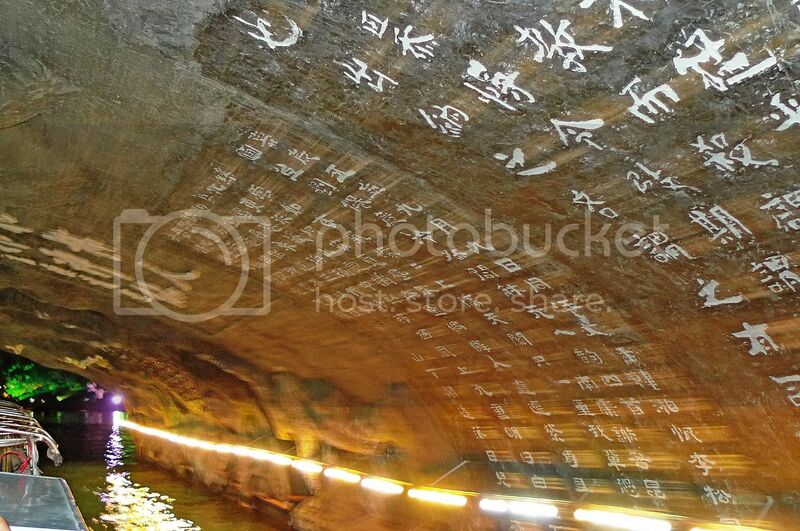 Carvings, images and chinese characters on the walls and ceilings! Awesome! 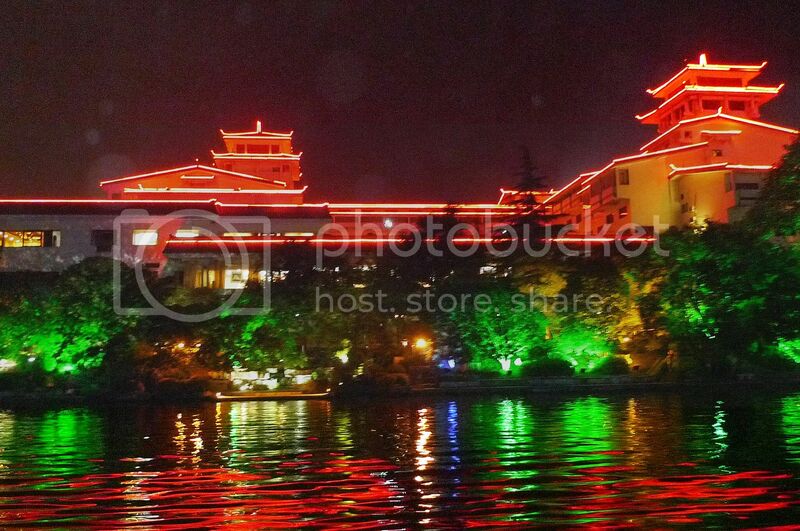 Buildings beautifully decorated with coloured lightings lined the lakes. I am not sure if this is a boat with a dragon head or a building on water! What do you think? OK, I don't know why I include this photo here. It must be me feeling dizzy trying to take photos in the dark on a moving boat! LOL! Finally, we came to the famous Twin Pagodas on Shan Lake! 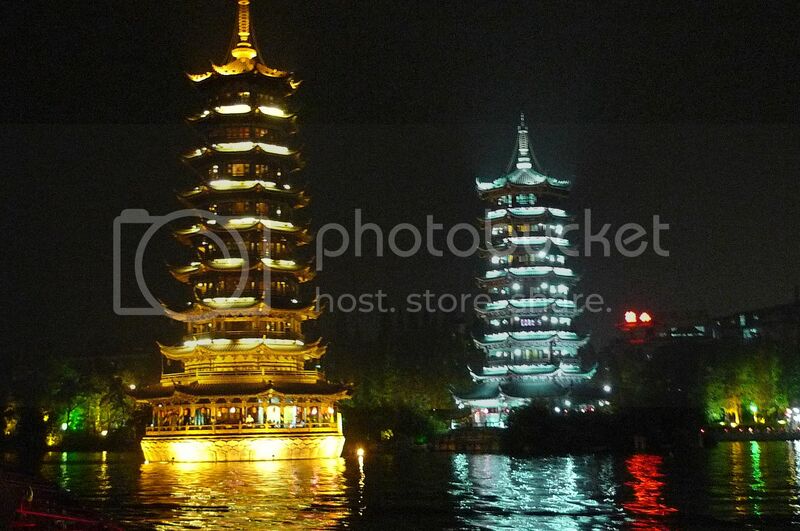 These two pagodas were the most magnificent structures that stood out that night. I was so mesmerized by these pagodas I went back to capture more photos of them a few days later. More about them in my future posts! After Shan Lake, we entered another lock area which brought us down back to the lower levels of Li River. We were then transferred back to the wharf. The whole cruise took about one and a half hour. ehhhh i like those views!!! SOOO NICE!!! gosh! the two pagodas!! gold n blue-ish! hey, very very nice photos!! 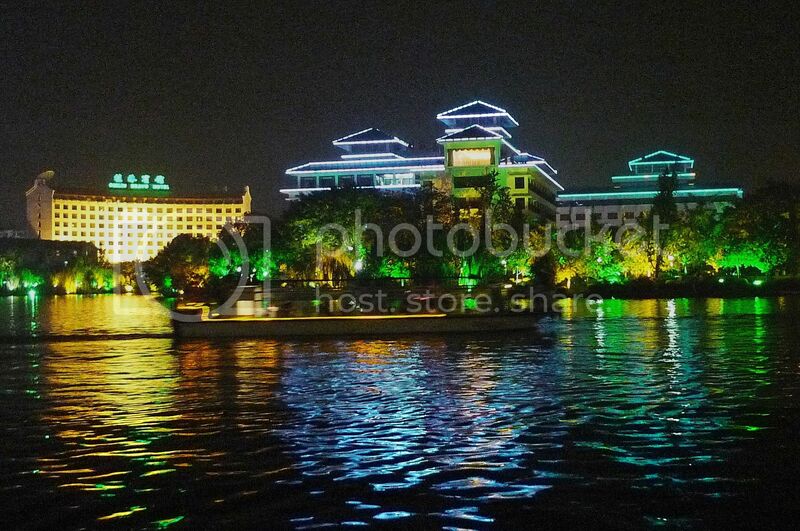 didn't expect they lit up all the buildings by the river..
and the one with chinese caligraphy carvings on the wall, i agree with you, simply awesome!! nah, mines wonderland?? i think that is a lot better and more beautiful than mines wonderland..
lovely series of pictures..i like the twin pagodas the most. you truly are quite the traveler aren't you foong! The photos are awesome! I like the carvings, images and Chinese characters on the walls and ceilings! WOW Foong! Your pictures took a while to load on account of my snail-ish internet connection, but it was worth the wait! I love the Pagoda! 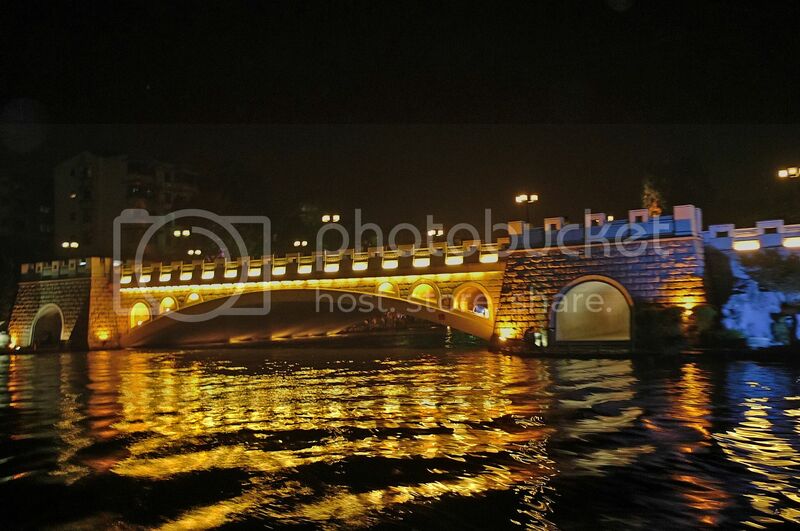 and the pictures of different bridges is breath taking! One bridge reminds me of London Bridge, the other reminds me of the San Francisco bridge..
And that Crystal bridge is sooo awesome! I love the gold and silver pagodas! Whoa! The view is sure awesome at night, with all the lights. Lucky you guys didn't miss the cruise, eh? 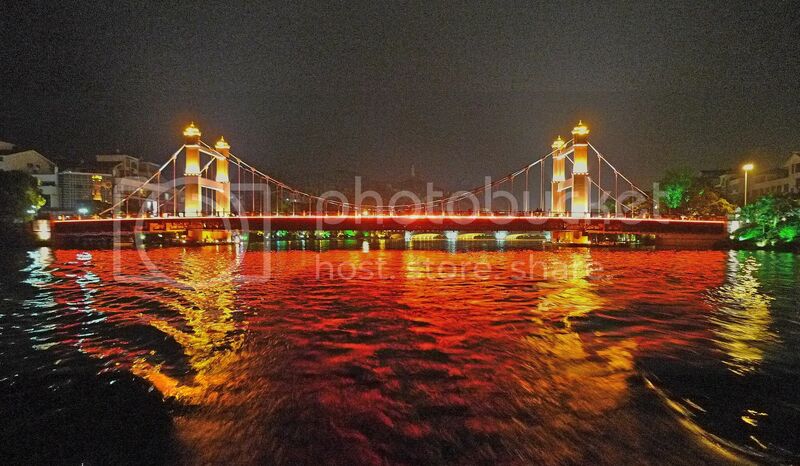 The night scene of the bridge with its colourful lights is pretty. nice!!!! 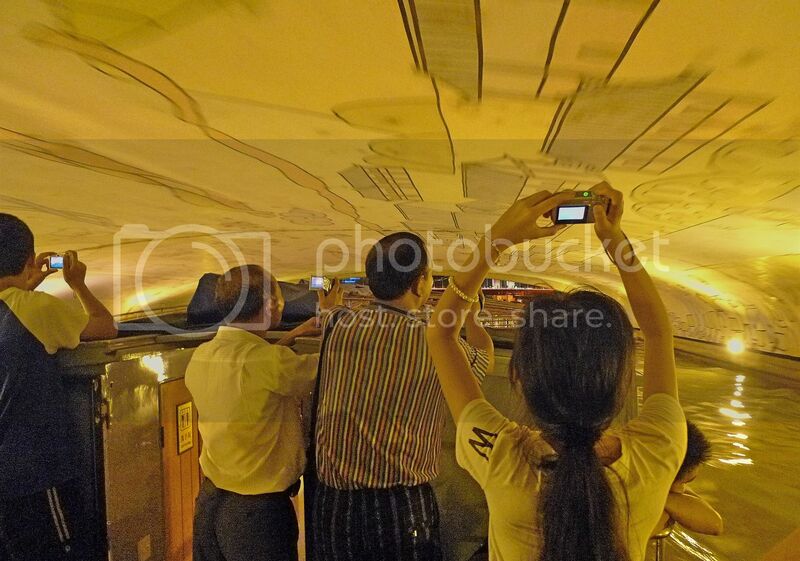 I love the drawing on the ceiling as well as the beautiful night scenes! Must be a great experience! Looks like an awesome cruise Foong, have yet to experience one! The bridges are spectacular, esp the view at night! And the carvings underneath the bridges are something else alright, wonderful pics all around, two thumbs up! Oh yeah, I have 'liked' this post. 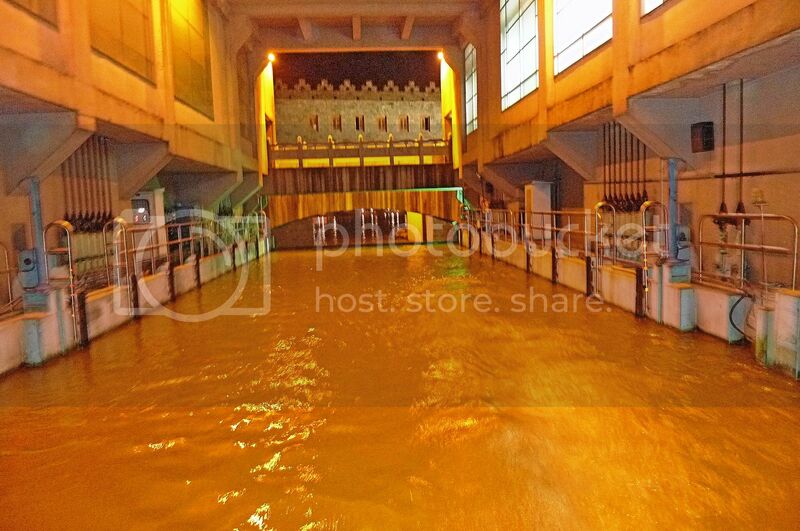 SK, the lighting of the buildings are nice right? I love the calligraphy on the wall! ane, I am not really a traveler, but I do love traveling! Haha! So you managed to identify the bridges! Yes, the Crystal bridge is awesome indeed. lina, yeah lady luck was with us! I would really regret if I missed this cruise! Woah...as if you are running for a 100 meter dash. At least you won and you reached the cruise. Seeing the pictures here make me understand why you ran the way you did. that looks like a great cruise with plenty of good photo ops. 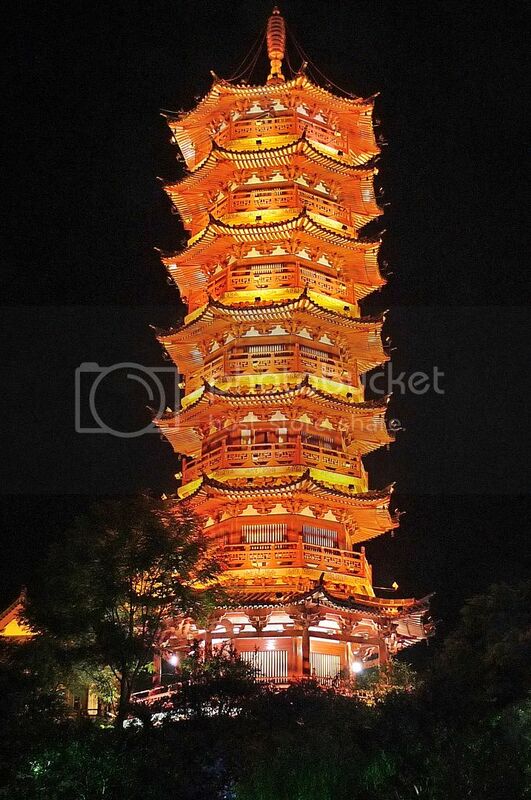 the Mulong pagoda looks spectacular. i also like how the buildings are adorned with such vibrant lights. wah th scenery is indeed very beautiful. you really like going to China huh? how much u spent for this trip? 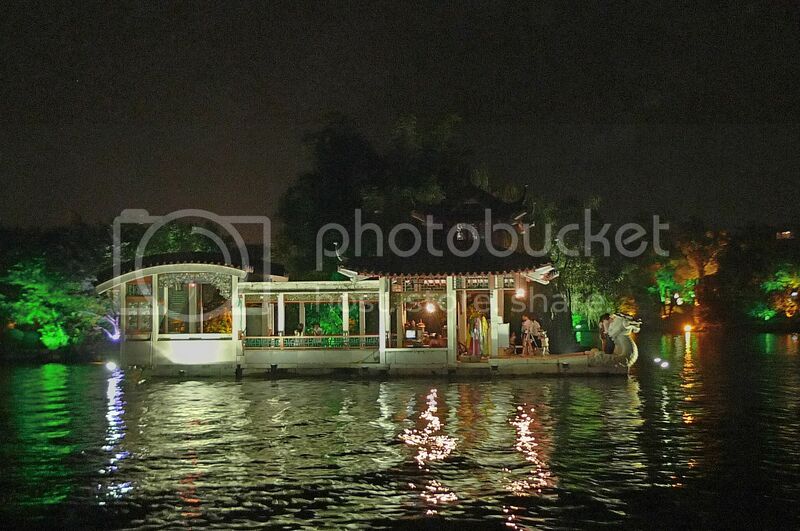 i wish i can spam more today but my time is really limited..
night cruise with all those stunning lights?!! wow!! Last time we were there, we heard about these fun cruises at night out on the lake that had an open bar or something like that. We can't find anything advertised as such.. They claim to have a master gunsmith on board and will have reloading parties every afternoon as well as optional marksmanship training. Wow such amazing and beautiful photos. You must have had a great time on that cruise. The night scenes have added extra beauty to the place. Thanks for sharing.. I think most of my photos for this tour came out really bad – so I may not be blogging about this too much. Good thing you blogged about it! Hey, the pictures are really very exciting.Carvings,images and chinese characters on the walls and ceilings! I hope it was an wonderful experience for you to be there. The Pagoda is looking brilliant especially the minaret. The painting on the inner side of the bridge is fabulous. One must enjoy such a thrilling journey. hanging lamps, yeah good thing I did! Haha! Your cabin will have towels and soap provided, including pool and beach towels. It will also have a generic hair shampoo so you do not need to bring that unless you like a specific brand. You can still wear shorts and swim wear in the pools and spas but not in public areas like dining rooms and restaurants, show rooms, bars, casino, etc.